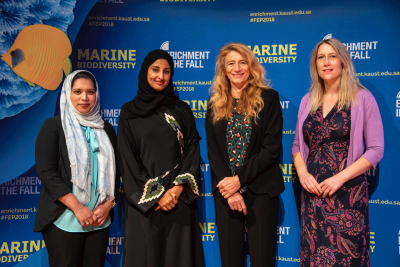 Princess Hala bint Khalid bin Sultan (pictured here) discussed the work of the Khaled bin Sultan Living Oceans Foundation during the recent Enrichment in the Fall program at KAUST University. The foundation seeks to put science at the service of nature and spotlights the marine environment as one of the Earth’s vital natural resources. It focuses on preserving the environment at all levels—locally, regionally and globally. This is done through conducting research, studies, seminars and conferences in cooperation with numerous countries and international organizations, as well as with local institutions that include universities and ministries in Saudi Arabia. Princess Hala bint Khalid bin Sultan, a member of the Living Oceans Foundation, spoke at the University’s Enrichment in the Fall program that took place on campus from October 20 to 23. She discussed her father Prince Khalid bin Sultan’s passion for diving—which began when he first dove in the Red Sea in the mid-1990s— and how this passion fueled the establishment of the foundation. When he returned to the same spot to dive several years later, he found the marine environment and corals there had changed dramatically, spurring him to establish the foundation….